The U.S. says Russia’s 9M729 missile system is a ‘material breach’ of the INF. “Today the United States provided Russia and other Treaty Parties with formal notice that the United States will withdraw from the INF Treaty in six months, pursuant to Article XV of the Treaty,” Pompeo said. Pompeo said Russia’s SSC-8 or 9M729 missile system represents a “material breach” of the treaty. “If Russia does not return to full and verifiable compliance with the Treaty by eliminating all 9M729 missiles, their launchers, and associated equipment in this six-month period, the Treaty will terminate,” Pompeo said. 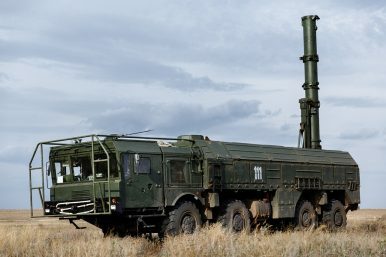 Moscow only publicly acknowledged the missile system’s existence in November, though it has reportedly been in development since the mid-2000s. The INF prohibits signatories from having any conventional or nuclear-armed ground-launched missiles of any type with maximum ranges between 310 and 3,420 miles. Russia has insisted the 9M729 has a range of less that 310 miles. “The United States has concluded that extraordinary events related to the subject matter of the Treaty arising from Russia’s continued noncompliance have jeopardized the United States’ supreme interests, and the United States can no longer be restricted by the Treaty while Russia openly violates it,” Pompeo said. On Dec. 4, 2018, the United States announced that Russia was in material breach of the treaty and gave the Kremlin 60 days to return to compliance.